This page illustrates the process for making a large architectural cornice molding in the traditional manner using hand planes. Due to some long term water leakage, a portion of the cornice molding on the original Westford Academy building (1794), now the Westford Museum, had suffered significant damage. Below is an image of that corner, including a newly exposed bird's nest, as it appeared after the rotted cornice was removed. The cornice was not an original 18th century molding, but rather material that was added during the building's restoration in the late 1970's and early '80's. In any case, it needed to be replaced with a matching molding, and rather than search for a replacement, or have a custom cutter produced for use in a modern molding machine, I offered to make a new 8' section using handplanes. In the 18th and a good portion of the 19th century, cornice moldings such as these were often made using a combination of hollows and rounds, and rabbet planes. For example, the cornice shown above would typically require two pairs of hollows and rounds, a rabbet plane, and a couple of bench planes -- seven different planes. 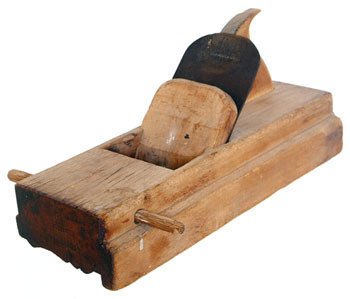 Alternatively, dedicated cornice planes such as the one shown to the right were developed in the 18th century. What this plane provides in terms of simplicity, requiring a single plane, is countered with the need for significant brute force. Given the incredibly wide cutting profile, this plane required two fairly strong men to operate, one pushing, and the other pulling a rope attached to the crossbar. Since I don't own a large, dedicated cornice plane that matches the existing profile, what follows is a description of the steps taken to create a replacement molding using several hand planes. Using this method, along with a comprehensive set of hollows and rounds, one can reproduce essentially any molding. The starting material was a piece of rough sawn, air dried 2x10 pine. The piece was planed flat and cut to width prior to tracing the old molding profile on both ends. The edges were jointed straight using a large jointer plane. Below, a plow plane is used to produce grooves coincident with the inflection points of the profile. These will serve to guide the subsequent planes and provide help in judging the profile depth along the entire length of the board. Using a wider iron also helps to quickly remove excess material. At this point I realized that I should have planed the board down some more before starting, so I simply used a scrub plane to hog away more of the surface. Below, the work of the #18 round plane is nearly complete. And here's the profile after using the #18 hollow plane, a rabbet, and a smaller hollow and round pair. One of the hollow planes is shown on it's resulting profile.